I bought these plants from a local ACE hardware last fall, well they are coming like crazy and the tag that was in the pot was handwritten and now - well faded. 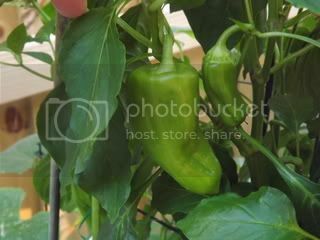 Are they Banana peppers, Cubanelle peppers, I have searched all kinds of pic(s) and forums to see what matches. I want to know just well to know - these are growing like crazy and I want to make a note - I can grow these. Also Cubanelle supposedly turn red if you leave them on plant. They are not hot at all. Thanks for any help! I would say, Not a bell pepper, but more like a sweet pepper. Going mostly by the first picture. If I understand it correctly, the sweet peppers with Caribbean names are derived from Italian sweet peppers. It could be that Cubanella was the 1st of this group. Don't be afraid to harvest one green, Avonnow. Probably, they will lose some of that wrinkly look and become darker green and shiny than they were at a younger stage. They don't have to be completely mature to be a wonderful addition to a meal! I am very fond of this whole group of sweet peppers. Compared to the bells, they just seem to be more "fool-proof." As Groucho Marx might point out, "And, he provides a good example of that!" Looks like undersized bell peppers to me. Judging by the broadness it seems to have in the second picture. Definitely taste one and see if you can figure it out! 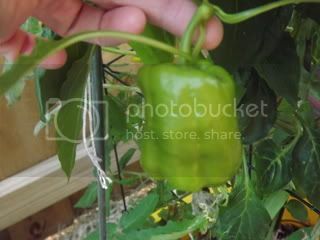 GardenRN wrote: Looks like undersized bell peppers to me. Judging by the broadness it seems to have in the second picture. Definitely taste one and see if you can figure it out! I've had bell peppers grow that way too. Unfortunately, not all my bell pepper plants make large fruit like you can often buy in the markets, so I use them for seasoning when they are small or misshapen and use the larger ones for stuffing. Actually the first pic looks something like a Pablano pepper but lighter green in color. are those the only fruits on the plant? if not then leave the oldest one to see what you have. looks to me some sort of mild pepper.